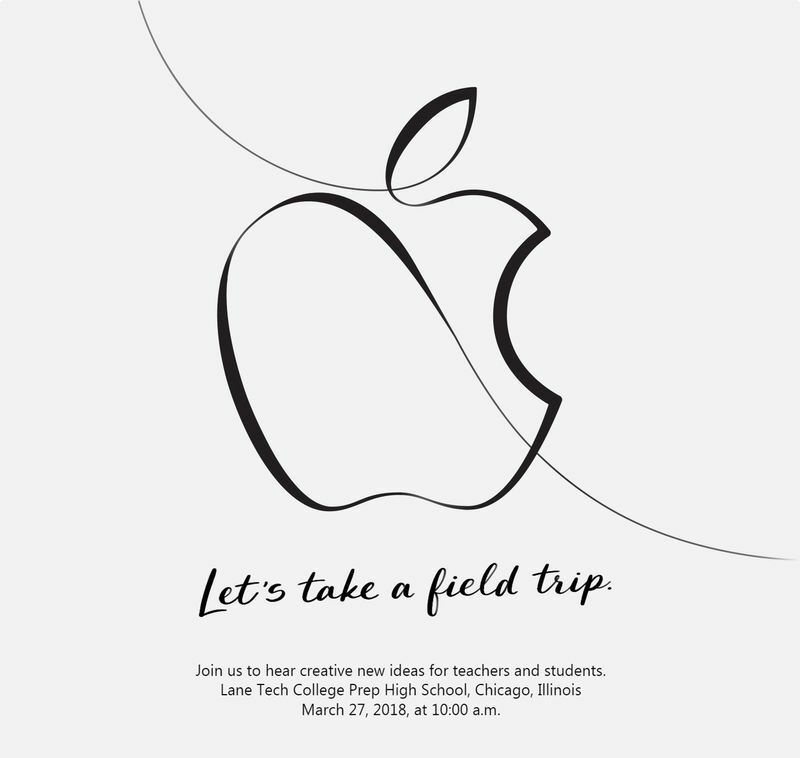 Apple today invited the media to an event on Tuesday, March 27 at Lane Tech College Prep High School in Chicago. The keynote will commence at 10:00 a.m. Central Time and will be focused on "creative new ideas for teachers and students," suggesting Apple has some education-related announcements planned. 9.7-inch iPad for $259: Taiwanese websites DigiTimes and the Economic Daily News reported that Apple is considering releasing a cheaper 9.7-inch iPad for $259—perhaps this will be education pricing. The current 9.7-inch iPad was released in March 2017 for $329. MacBook Air for $799 to $899: KGI Securities analyst Ming-Chi Kuo said Apple will launch a more affordable MacBook Air in the second quarter of 2018. The estimated $799-$899 price range comes from WitsView researcher Yubin Qiu. The current MacBook Air starts at $999. AirPower charging mat: A trio of reports claim Apple will launch AirPower in March. The mat can inductively charge multiple Apple devices at once, including the iPhone 8, iPhone 8 Plus, iPhone X, and Apple Watch Series 3. It will also be able to charge AirPods placed in an optional charging case. Wild card — a second-generation iPhone SE: Rumors have been swirling about an iPhone SE refresh, with speculated features ranging from a larger 4.2-inch display to an iPhone X-like design, but Kuo recently cast doubt on the device launching in the first half of 2018. A new Apple Pencil: The artwork for Apple's invite appears to be inspired by the Apple Pencil, so perhaps we'll see an updated version of the drawing tool or support for the 9.7-inch iPad. Apple recently announced that its Everyone Can Code program will see a citywide expansion in Chicago's public schools and city colleges this spring. The curriculum will bring coding opportunities to Chicago's nearly 500,000 students. It's likely we'll learn more details about this initiative at the March 27 event. Apple hosted a similar education-focused event in New York City back in January 2012, where it announced iBooks 2 with interactive textbooks, iBooks Author, and a new version of iTunes U for iPad. Maybe they will finally have an answer to to Google....I am a teacher, and love Apple. But they are simply not an option for many schools....google is eating their lunch. Schools need iCloud accounts with a lot of free storage, easy device management, cheaper devices (which the cheaper iPad will be), and the ability to have kids login to any iPad (which won’t come). Just update that damned Mac mini, and I'll shut my face a couple of years. Yeah, the old Mac SE was getting a little long in the tooth. If i was going to read into that Apple poster for the event with the flowing calligraphy like graphic, i'd say it looks like it was created with an Apple pencil. Hmm. I would therefore further speculate that Apple will announce that the rumored new low cost ipad will now be able to use the apple pencil. Think about it. Whats more synonymous with education than pencil and paper? Students taking notes on their ipads. Teachers correcting student papers on their ipads. Etc etc. I think it's about time too. I've always felt that being able to use the apple pencil should not be exclusive to pro models. A pencil is such a universal tool. And Think of how many more Apple pencils Apple would sell if they could be used on all their ipads. As an ipad mini user, i have always wished to be able to use the apple pencil on my ipad mini. It would be the perfect portable sketchbook and notetaking device. I've heard no rumor about an ipad mini update, but if my above guess about the apple pencil and new low cost ipad is true, i hope Apple also updates the mini as well. Guess we'll find out if i was right in a couple weeks. Can't wait to hear Apple claim someone's patented tech as their own.... like that that Steve Jobs said 'We have invented multi-touch... and boy have we patented it!' Except that it was invented by Bill Buxton. Funny how a lie like that doesn't matter. Article that has nothing to do with Jobs or multitouch? Check. Someone trying to bring it up to find something to whine about? Check. Students want an iPad mini 5 with Pencil support.